The EvapoDry employs a submerged, low temperature burner to evaporate solutions at approximately 180° F – 186° F, eliminating the vaporization of heavy metals and the organic breakdown of most solids. Precipitated solids are removed from the evaporator tank bottom with our unique hands off, user friendly conveyor system. 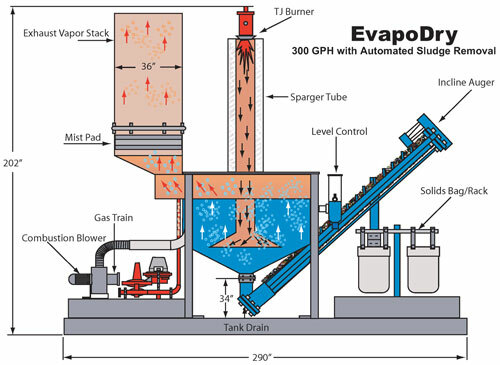 EvapoDry systems efficiently evaporate wastewater and auger out the settled solids buildup from the evaporator tank bottom. A submerged burner tube fires below the solution level, which achieves 95% +energy efficiency. 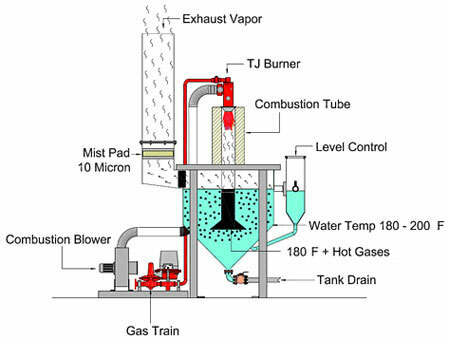 The hot gas contact with the liquid creates almost instantaneous vapor while the combustion gasses rapidly mix the liquid for even heat distribution. Extensive testing has proven that submerged combustion can save as much as 25% in energy costs, compared to serpentine tubes and hot plates. The uniqueness of the EvapoDry lies in the cylindrical, cone-bottomed solution tank. A drain port affixed to the cone allows for easy removal of any solids build up which will settle in the cone. Consists of a high temperature fiberglass resin vessel, utilizing C2000 stainless steel sparger tubes, or 316L stainless steel vessel with Inconel 625 tubes, which offer superior resistance to chemical or chloride attack. An inclined auger conveyor can be added to each model. 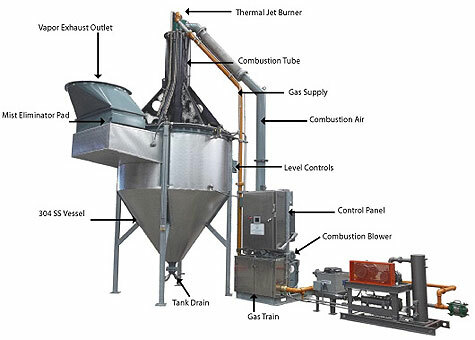 The inclined conveyor extends upward above the evaporator solution level and deposits the sludge material into the owners drum or into a dewatering system. 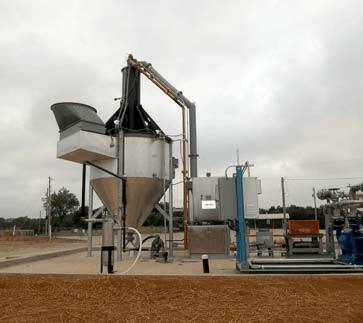 The oil skimmer is furnished as an option to remove floating organics, as necessary.The enclosed vessel has a 10-micron poly mesh mist eliminator to ensure that only vapor is released into the atmosphere. Exhaust Stack Dia. 8" 10" 12" 14" 18" 20" 24" 30" 36" 48" 54" 60"
Gas Pipe Size natural) 3/4" 3/4" 3/4" 1" 1" 1" 1 1/4" 1 1/2" 2" 2" 2 1/2" 3"
Gas Pipe Size (LFG) N/A N/A N/A N/A 2" 2" 4" 4" 4" 6" 6" 6"
Feed Pump Pipe Size 3/4" 3/4" 3/4" 3/4" 1" 1" 1" 1" 1" 1" 1 1/2" 1 1/2"
Drain Pipe Size 2" 2" 2" 2" 4" 4" 4" 4" 4" 6" 6" 8"
Learn more about our evaporator design specs.